The second generation Toyota Celica was the first production car design from the company’s California-based Calty design center. Today’s Nice Price or Crack Pipe '78 is their Liftback design, but is its price designed to give you a lift? When introduced in to the U.S. In 1971, the Toyota Celica made a splash, albeit, one not as big as that of the Datsun 240Z which had hit the market a of year earlier. The Corona-based Celica lacked an IRS or a smooth straight six, and instead of competing with the likes of European sports cars, it brought a fuel-efficient, four cylinder sensibility to the waning pony car market. By the early ‘70s, the short-lived golden age of the pony car was at an end, having been driven to emasculation by insurance costs, pollution controls, and concerns about gas mileage. That mini-Mustang esthetic became a hit however, the Celica taking off as a stylish and practical pony here in the States. So important was the US market to Toyota that when the company decided to supplant the six year old car with a new model, they assigned the styling responsibilities to their new Calty Design studio in Newport Beach California. The design of the second generation Celica was led by Art Center Graduate and former teenage TV star (Marty of Disney’s Spin and Marty), David Stollery. Today’s fly yellow first year, second gen Celica might just spin Marty’s head as it’s about as clean and stock as you could imagine. With but 40K claimed miles under its belt, it’s no wonder the car also has picked up multiple show awards. Aside from some fading in the carpet under the hatch, and some sag in the side panel vinyl in back, the interior looks remarkably clean, and appreciably stock. The bodywork as well looks factory fresh, right down to complete badging, an unleaded fuel only decal on the locking gas door, and - most amazingly - black rubber baby buggy bumpers that haven’t turned to powder due to time and pollution. 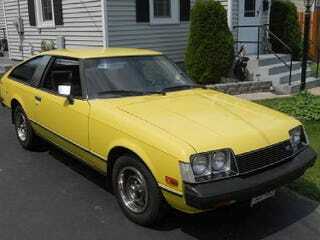 In the US, the ’78 Celica was powered by a 96-horse edition of Toyota’s solid as a rock 20R. That SOHC 2,189-cc four is backed up here with a five speed stick and the under-hood view matches the rest of the car for its immaculate reception. While this Celica is obviously an opportunity to do the time warp again, its price will have to be paid in post inflationary dollars. That price is $6,500, and it’s now time for you to decide if that’s a deal or not. What’s your take on $6,500 for this amazingly preserved pony, is that a price that lifts your back? Or, does that price make this a Celica that’ll never sell. . . ica? 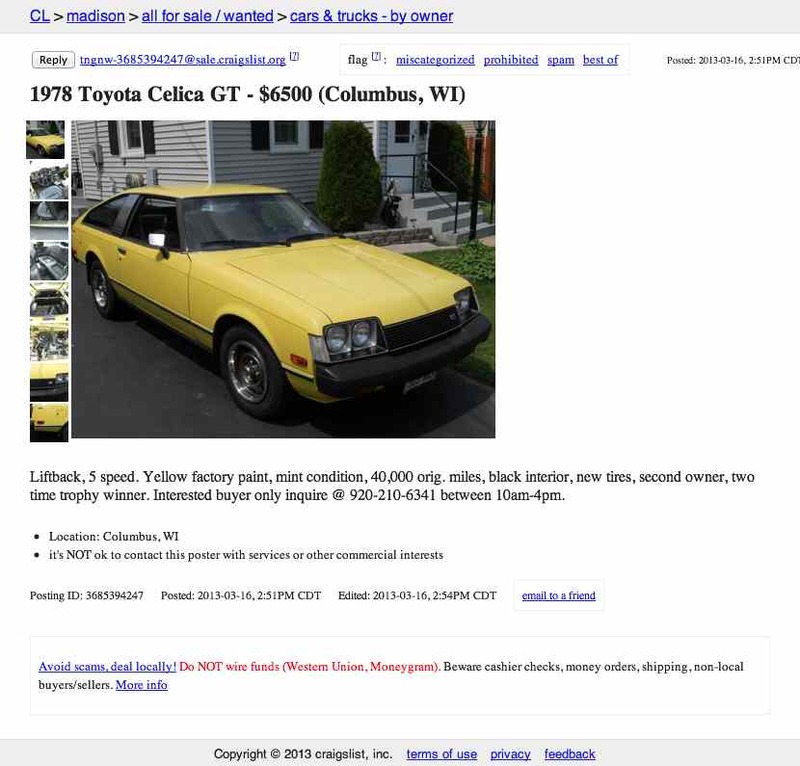 Madison Craigslist or go here if the ad disappears. H/T to Epic_Cheese for the hook up!